The GENERALI VISION plans is the most beloved cash cow for those usual culprits among the IFAs which target Expats in Germany, especially the CTMNBN. Why: it pays a princly or even royal commission to the "advisor" and the commission is risk free for the advisor. Because the terms and conditons of the plan say, that you HAVE to continue paying your premiums during the initial period no matter what. What does this mean? If and when you have been signing up with a GENERALI VISION plan as your offshore pension plan, there is a so-called initial period which varies based on the duration of the contract period you sign up for. As you can see here, if you sign up for 30 year duration - which is not unknown for pension planning - your first 28 (!!!) premiums go in full into paying "administrative fees and costs" which mainly means commissions. 1. German courts have decided now that it is illegal to continue charging administrative fees if a plan has already been cancelled. In this case, Prisma Life from Liechtenstein, even set up an extra contract/agreement, signed by the clients, to this regards - which also been found illegal and thus not legally valid. If you are in a situation where you just detected that you have been tricked into signing up for such a plan and already paid some money into it but are still way within the initial period, this is your first step to tell the advisors and Generali what to do when they come back and still want to continue charging you - because for you as a German resident the German laws are prevailing and Generalli has to comply to them. This link may seem at the beginning to be misleading, as it talk about a victory of the German insurance companies in a court decision. But the victory only was that they can keep back abut 50% max of the already paid premiums. This means on the other side that they always have to pay out at least 50% of the paid/invested premiums, something which Generali Vision so far has always tried to reject. Generali International Limited is a Licensed Insurer under the Insurance Business (Bailiwick of Guernsey) Law 2002 (as amended) and is regulated by the Guernsey Financial Services Commission. - secondly, German laws for insurance/investmend advisors require full disclosure of the costs for the plan BEFORE you get the application and in FULL EUR and not in percentage points or inital period months. I have never seen so far any IFA/typical culprit active in Germany to do a proper disclosure and therefore the contracts are not set up in a legally compliant way in Germany. If your advisor or his company are not properly registered there, they are not complying to German laws and thus not allowed to offer advice/sell insurance or investment products. Obviously, you are best advised if you never sign these plans in the first place---- but too often you will not be aware of the traps and loopholes in the Ts&Cs and the IFAs will never tell you cause they know nobody would evere sign such a thing otherwise. thanks for the very comprehensive explanation about Generali Vision plan. I was recently approached by a IFA from Trafalgar International GmBH (registered in Germany), who offered me this as a pension plan. After carefully reading the plan T&Cs and also doing some research on the internet I might not choose the plan due to high fees in the first years. I'm wondering if I can have the tax benefit from this plan being an offshore plan. I'm a italian passport holder living in Germany. Also, is it illegal what Trafalgar is doing by selling a financial product from a institution that is not registered in BaFin? May I contact you directly (PM or email?) There are a couple of of "advisors" from another company that has no adequate license at all who moved over to Trafalgar recently. I know the names and would be interested to see if it is them as I am after them and their former company for all kind of violations of consumer protection laws and financial registration etc. 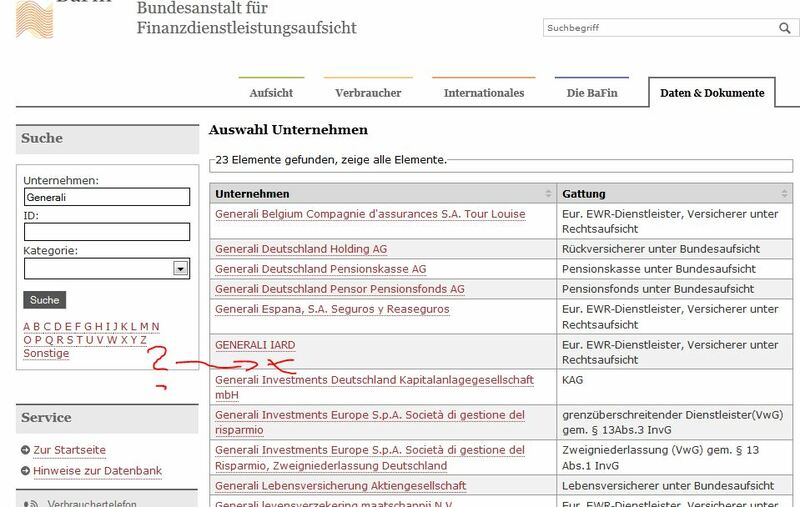 Trafalgar has actually all the required licenses for Germany to offer insurance and investment advice - but that does not allow them to offer illegal products and the Generali Vision plan is not registered at the BaFin (federal finance regulation authority) for Germany. Therefore it is not allowed to offer them indeed. I also would love to see how you have been advised, i.e. what info has been given to you so far about the company, the advisor and the investment/pension plan as I am collecting evidence to this regards (your name will be kept out of this entirely). That looks really helpful. Hope people make full use of it. The company you refer to in your links Lorelei, is Generali Worldwide who sell employee benefits products and services to companies not individuals. They are not Generali International. No policyholder has suffered actual loss as a result of the failures identified. As I said before I am no fan of insurers, nor the widespread shady practices within the whole industry, but it pays to have your facts right because these people can and will sue if you don't have. In the part of Starshallow's post which I quoted, there is no mention of losses. He refers to regulatory rules, to Guernsey and to Generali. Hence the links to news reports referring to regulatory rules, Guernsey and Generali. It may or may not be useful for holders of Generali Vision to know that the Guernsey regulator has fined a Generali company in Guernsey, which is also the location of the Generali company which administers Generali Vision and which will be subject to the same regulator. Certain companies that target expats offer this product even if the person's life expectancy is less than 15 years (source: personal experience). So if you get offered this, it is a fairly good indicator that the 'advisor' you are dealing with is a would-be thief and a con artist. This means that certain IFA companies "that must not be named" and/or Generali Vision cannot force anyone in Germany who foolishly enough signed up with such a pension plan to pay the entire "initial period" before he can cancel. I have seen in the past that such demands were made by either Generali Vision or the IFAs. 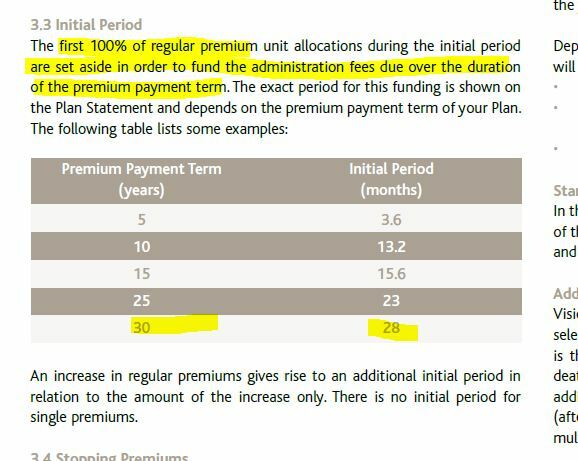 if you signed up for 30 year duration - not uncommon for pension plans - the "inital period" according to the Ts&Cs is 28 months...which means they want you to pay the premimium the entire 28 months before you can get out of the plan, at which point you have zero capital actually in the plan. Total loss. Da die Verrechnung der Abschlusskosten bei einem Versicherungsvertrag (insbesondere einer kapitalbildenden Lebensversicherung) nach dem Zillmerverfahren in den ersten Versicherungsjahren zu keinem bzw. nur einem geringen Deckungskapital führt, sieht § 169 Abs. 3 VVG einen Mindestrückkaufswert vor, der bei einer vorzeitigen Vertragsbeendigung durch Kündigung zu erstatten ist. Das Zillmerverfahren wird hierdurch nicht ausgeschlossen, sondern dem Versicherungskunden wird hiermit lediglich ein gewisser Mindestrückkaufswert garantiert. Nach der Schutzvorschrift des § 169 Abs. 3 VVG ist dem Versicherungsnehmer bei einer Kündigung mindestens der Betrag des Deckungskapitals zu erstatten, der sich bei gleichmäßiger Verteilung der angesetzten Abschluss- und Vertriebskosten auf die ersten fünf Jahre ergibt. Von diesem Betrag können jedoch weitere Abzüge erfolgen, sofern vorher eine entsprechende vertragliche Vereinbarung vorgenommen wurde. Gemäß Absatz 5 ist ein solcher Abzug nur zulässig, wenn er vereinbart, beziffert und angemessen ist. Die Vereinbarung eines Abzugs für noch nicht getilgte Abschluss- und Vertriebskosten ist hingegen unwirksam. Especially the phrase which I put into italics and bold is interesting: the deduction of administrative costs and commission costs is only allowed in case of a cancellation if it was agreed, enumerated/written in full EUR and is fair/appropriate. 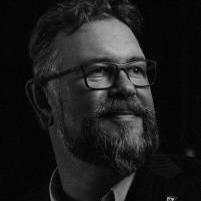 While Generali Guernsey can always claim indeed that the deducting of costs during the "initial period" is part of the contract and thus counts as "agreed" if the client signs it, the other two points are where they lose out any court dispute: because IFAs like TCTMNB do never ever put the deductions in the first years in the quote in FULL EUR - otherwise nobody would be stupid enough to sign. The Ts&Cs of the plan only talk about so and so many monthly premiums ... this is not what "beziffert" means. And on top of that, the German courts are very clear that "0" payout after 1 or 2 years of paying into such a plan is neither fair nor appropriate. Most German courts have ruled so far that at least 50% of what you paid in has to be paid out to you. We inform you that Generali International Ltd based in Guernsey is not allowed to carry on insurance business In Belgium under the right of establishment or the freedom to provide services. The reason being that Guernsey is one of the British Crown possessions and as an independent administered jurisdiction, it does not form part of the United Kingdom or the European Union. We hope that this information will be useful to you. If someone has been a victim of such illegal activities and is about to lose real money - pls stand up for your rights and take those on who sell this. You have a good chance to get most if not all of your money back. So I was also duped into signing up for the 5 year version of this plan, but it was not until recently that I found out why I was losing so much money. First off, to anyone who does not know this, the fees are based on YOUR INITIAL PREMIUM AMOUNT. I was advised by my advisor that I should start with higher initial premiums and then reduce them to the minimum or whatever I felt I wanted to pay later. As I never saw or received a copy of the terms and conditions, I had no idea that by reducing premiums was a death sentence to my plan. I am now paying about 12% in fees per year. I am just about halfway though my policy (I have 2 years 9 months remaining), and want nothing more than to cancel my plan and get back as much as I can. I have been in contact with Generali, but they have been no help, even though they cannot provide me with anything signed by me that shows I agreed to their terms or that I saw them. I currently live in USA but I have both a US and German passport. My plan was set up in Cyprus, and the guy who set it up used his address in Poland as my address. Looking back on it now, I realize how stupid this whole thing was, but now I am hoping there is some way out of it without losing most of the money I put in. Oh dear - this is a typical case (I have another couple (Brits) who were tricked while in Cyprus) but in your case it is even worse than what happens in Germany. The company that must not be named (TCTMNBN) was operating offices in Cyprus. They were not licensed by the Cyprus authorities but were acting, in their understanding, under passporting rights from the Belgium authorities (FSMA). However, the passporting rights from Belgium were only for cross-border services - and running an office in another EU country falls under the freedom of establishment and not under the freedom of services. Any establishment ought to be fully licenses locally, though. What you can try is this: tell Generali Guernsey that their plan was never licensed/allowed to be sold in Cyprus (or any other EU country for that matter) or, if they think differently, demand from them proof that they were actually licensed. Threaten with a report to the Guernsey authorities and for good measure to the British FSA. Demand info from the TCTMNBN how they were licensed when selling you this in Cyprus. If they can't offer proof, then obviously the entire advice was illegal and the contract should be considered nil&void from the beginning. But you need to be both patient and persistent. You might also want to check what media have reported recently about certain IFA companies settling with clients and approach them as well. If it help you: you are not alone and others were even worse advised. It is typical for them not to tell you that reducing your premiums or taking a premium-holiday does not effect your initial costs, i.e. you suddenly pay more costs for less money invested. I was contacted two years ago by a woman living in Bahama island who wanted to invest 80.000 dollar lump sum. She was signed up, unknowingly or not understanding, for the same plan like you but with the set-up that she pays the amount EVERY YEAR for several years. thus she was first puzzled when after one year she was asked to pay the next yearly amount and shell-shocked when she found out that by cancelling she lost the entire amount of money invested... beat that! Wow! That is a terrible story! I hope that she was able to find a way to get at least some of her money back. I am not sure if this is a good or a bad thing, but the company that signed me up for my vision plan sounds like Winnacle Pealth. I assume I should try to find out the same thing: if they are legally allowed to sell Generali Vision plans in Cyprus? Another ridiculous thing, is that I find nothing in the contract that I signed, about acknowledgement of receiving or reading the terms and conditions where it would state the surrender terms or the fee percentages and structure. I have asked Generali and in 3 emails, they have said in 3 different ways, that it is somewhere in the papers I have signed. They have yet to highlight the point or tell me what number addresses my acknowledgment. Hi, I have been through all the exchange in this forum as I have just realized yesterday that if I surrender from this Vision Plan from Generali, I will loose almost half of the money I placed. Administration fees! In other words, have been screwed by The Company You Cannot Name (TCYCN) and which is operating freely in Switzerland. The guys from TCYCN are chasing for new victims and I trusted them since they were operating inside the large american company am working for. Here is the situation: Am living in France, I was working in Geneva for a large american company which I will not name. I trusted one of my colleague who recommended them as he is a good person and because lot of people in the company I was working with had such a plan with TCYCN. I need cash as I am moving to Dubai and I asked to surrender the plan and get my money back. I received the estimated value of my plan and it represents less than half of the money I placed. 11900€ vs. 22500€ I placed. I don't even talk about the benefit of the plan. I talked to one of my friend who told me that these plans are illegal in France since 2007. I am now investigating to check how much I can get back, if I can ever get my money back. I signed it in Switzerland, I live in France, and am moving to Dubai. If anyone in this forum can tell me what I can do, I promise to be very grateful! We need a list somewhere of those companies one should be vere cautious about dealing with. Legally the most important point is that you lived in CH and signed the contract there. Therefore CH laws apply. If you check the Swiss sister-website to Toytown, you can find info that another guy in CH got ALL his money back after he showed to both TCTMNB and (!) the GEnerali Vision plan were not legally licensed for business in CH. Apparently, in the meantime TCTMNBN seems to have received some registration with the PolyReg - but it would be important to check how they were (not) properly licensed to at this particular point in time, just as well as the Generali Vision plan is, I think, still not properly allowed for distribution in CH. If you make enough fuzz and noise and start contacting the local authorities while telling TCTMNBN and Generali Vision/Guernsey that you intend to escalate this full-scale (including complaints with the British FSA for good measure) , chances are pretty good that you get your money back. But it will take a few months and a lot of nerves...be prepared for that. And have someone check, what laws for consumer rights are/were in existence n CH, i.e. what kind of info you should have received under CH as client at what point of the advice process. At least here in Germany they are not even closely adhering to required legal documentation of the advice etc. which makes is easier to attack such malpractice. I would be interested to hear how you get on. I too have been fooled whilst working in Switzerland in 2008. Now back in UK and have wanted to surrender plan for some time. Am in process of getting evidence together to submit official complaint to HQ concerned. Have submitted requested to FINMA (Swiss Financial Market Supervisory Authority) for letter confirming sale of product in question is (and was) not authorised in Switzerland. I was an expat in Switzerland with a similar story, swindled by the firm we know all too well into the Vision Plan in 2011. I'm just wondering if any of the posters above who signed plans in CH have made any headway with getting anything back? I'm looking at basically a total loss, and will contact FINMA in due course, but am still curious to know if there's any hope. in the SWISS forum there was a thread (well hidden now) where an Expat got all his money back from the CTMNBN when stating that they were not licensed in CH nor was the product General Vision at that time. Apparently the company IS now licensed thru PolyReg in CH, at least it says so on their documents...haven't checked it yet. So it would all depend on timing, i.e. when did you sign this plan. furthermore it always helps to check what the consumer protection laws in a country (Germany or CH likewise) say about min. standards for financial advice. In Germany they virtually always fully violate these standards which makes them fully liable AND the signed contract nil&void under German laws (which have to be applied here if -as is the case - they are running a branch/establishment in Germany). I can't say anything about the CH laws and regulations but am certain that there are some decent ones for financial advice which will help you to get your money back based on malpractice. It always helps when you can convincingly threaten them to involve the local authorities with the goal to have them shut down there. I've been following this thread as I just discovered what a mistake I made by entering into this plan, sold by CTMNBN (who I foolishly agreed to work with after being recommended by a trusted colleague). I have been paying into it for coming up to a year and I intend cease any further payment and try to reclaim the premiums paid so far. 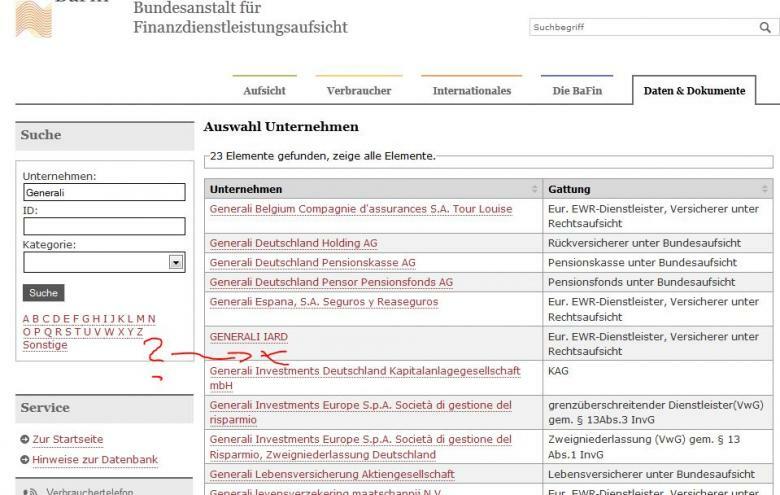 I recently contacted FINMA and was informed "Generali International has no FINMA authorisation for an activity on the Swiss financial market". I am seeking further clarification from FINMA as to whether I can consider that, since the product was not authorised to be sold, the contract can be considered null and void. Interestingly, while the Suisse subsidiary of CTMNBN may have a PolyReg membership, the advising entity on my Generali Documents has a Maltese address (though strangely the form of incorporation is a GmbH). I also intend to check with PolyReg whether this entity is authorised in Switzerland. Starshollow, can you give any advice as to what may happen if I just cancel further payments and declare that the contract is void based on malpractise due to the above factors? Assuming they don't concede this and continue to demand payments through the initial period, what could be the consequences if I refuse to pay? I have yet to contact CTMNBN or Generali as I wish to arm myself with as much evidence as possible in advance. I am very much in TC5's situation, same location, same players. I ampart way through an 'initial initial period' and 'secondary initial period'. When we ere referred by a friend to CTMNBN, we had a large current account surplus, a small regular monthly surplus, a young child, no mortgage (but expressed desire to buy) and plans to have another child. Oh, and I had no pension. We were steered away from sorting out the pension(!) and making a 5->10yr lump sum investment (even though we said we fancied the risk due to the large current account) and onto the Generali Vision plan. In retrospect we needed nothing like a long-term savings plan. Despite this, after signing up for an initial 1,500k a month payment, we had a 'review' later and ended up committing to 2k a month! As I understand it this has lead to another initial period starting. Now with our second child on the way and my wife intending on taking a year off and considering not going back afterwards we are looking at having to come up with 2k a month while she doesnt earn. Saving towards a mortgage sounds like a pipedream at this level and still no pension sorted. Quite apart from the technicalities of miss-selling by not highlighting all the costs, it seems plain as day to me that there is a large slice of circumstantial miss-selling here. Its almost totally inappropriate. Almost any change in our circumstances would totally destabilize our current position of treading water, doing that for 19 more years seems like a big ask. I think I can follow up on the advice on how to get out of the contract and try and recover as much as what was paid in from the notes above. However, I would like some colour as to what makes this fund so bad if I were to take it to term? When I challenged my advisor over fee's yesterday she was quoting fees of .5%. Others have allude to fees in some other form. Can anyone clarify? My understanding right now is that this whole initial period thing is a massive stitch up whereby all your funds go elsewhere. I am wondering though, if it wee taken to term would these not be amortised? At that point is it really so bad? Or is there something else inherent in the structure that means any attempt to reduce payments over the lifetime of the plan just makes it incredibly bad value from that point on notwithstanding the initial period? In short, is it really the best course of action to burn 24,000?